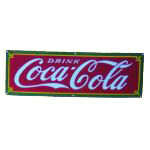 “Submarines” announces the block text on this antique Coca-Cola sign. The sandwich shop sign is a white rectangle with thin blue stripes. Below the word “Submarines” is a vertical Coca-Cola logo, the horizontal red Coca-Cola scripted logo, and the picture of a Coca-Cola bottle.